The Jack Saint Clair Memorial was first held in 2008 and created by former Temple University cross country runner, Dave Thomas, as a way to remember his former coach. Jack Saint Clair Jr. was a long time athlete, coach (Cardinal Dougherty HS & Temple University) and also one of the designers of the cross country courses at Belmont Plateau. "The Saint" often boasted that he created one of the toughest CC courses in the country and he believed the course should be challenging but fair to the runner and truly test his overall speed and conditioning. 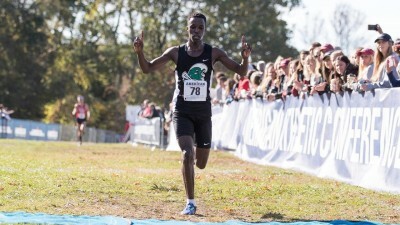 Since 2008, the race has grown into one of the most popular races during cross country season at Belmont Plateau as it is one of the few races that is open to college as well as open post collegiate runners and clubs. The 2008-2010 men's race used the orginal 5.18 Classic Course that "Saint" designed in the 2960s , but a severe strom has wiped out the Surekill Hill access and forced a new design and 8000 meter course without Saint Clair's Surekill Hill. We hope to bring back the original Classic Course for this race in the future. Open runners competed in the race the first few years, but it has grown to about 20 men and women teams competing each year from open clubs, NCAA College and college club teams competeting. The women's race is the only 6,000 meter race run at Belmont Plateau. JSC course was the Classic 5.1 mile course from 2008 to 2010 (Surekill Hill). The JSC course was 5 miles (for 2011 and 2012) and has been using the 8000 meter Liberty Bell Course from 2013 to the present.